I have always loved music. Ever sense I was a kid playing my Atari and listening to my radio full blast. My mom got me a microphone that could broadcast over a unused channel on the radio and I would talk on it and ended up being a dj at a very young age back in the 80's I would play heavy metal through my microphone after I talked. I would play bands like Aerosmith, WASP, Guns n Roses, and the like. I had a lot of fun. Even though the microphone only broadcasted about 10 feet from the only radio in the house. 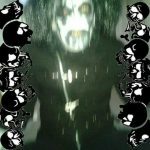 I got into Gothic music in the 90's with King Diamond, Mercyful Fate, Death SS, and the like. I have a new show on WMPG called The Crypt. I play the darkest and creepiest metal that I can find. Volunteering for WMPG is so much fun I love being on the radio.